Over 50 years ago Russian physicist Sergey M. Stishov synthesized a new dense tetragonal form of SiO2 at high pressure for the first time. This same mineral was later found in a sample from the Barringer Meteor Crater and was named stishovite in his honor. To date, experimental studies have led to the conclusion that stishovite represents an important phase in the mineralogy of the Earth’s interior below about 300 km in depth. In addition, stishovite has been shown to possess important physical properties such as high hardness (9 on the Mohs scale), toughness similar to that of zirconia, and a high refractive index. Periodic mesoporous materials (pore size 2-50 nm) have been considered of great interest due to their improved adsorption and diffusion properties compared with microporous materials (pore size of 0.5-2 nm), such as zeolites. In the last six years, collaborative research involving scientists at Carnegie and Lehigh University has focused on the possibility of obtaining mesoporous crystalline silica materials through a nanocasting route at high pressure from periodic mesostructured precursors. This research has resulted in the synthesis of novel materials such as mesoporous quartz, coesite and diamond. Physical properties such as hardness, thermal stability, and luminescence can potentially broaden the industrial applications of these materials. These mesoporous silica polymorphs also appear suitable as potential adsorbents and in host-guest chemistry. 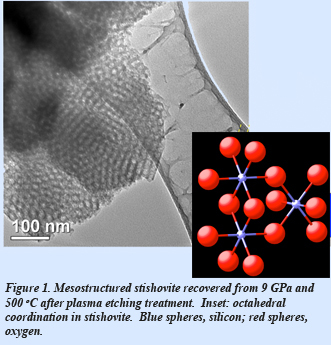 Although bulk stishovite has been studied for many years, the synthesis of mesoporous stishovite having an accessible degree of porosity would be a key breakthrough in the study of mesoporous materials. Recently, EFree scientists Vincenzo Stagno (now Ehime University), Yingwei Fei (Carnegie), Manik Mandal (Lehigh), and Kai Landskron (Lehigh) reported the first synthesis of weakly mesoporous stishovite at 9 GPa and low temperature (500 ºC), from a periodic mesostructured FDU-12/carbon composite precursor using a multi-anvil apparatus. Owing to the easy amorphization of stishovite at the low temperature of calcination, an oxygen plasma etching technique was employed to remove carbon from the pores. Accurate measurements performed on the recovered samples suggest that the small pore volume (~0.15 cm3/g) and surface area (~ 45 m2/g) compared to the previously synthesized mesoporous stishovite and coesite, are likely a result of the high pressure synthetic conditions. Optimizing the combination of synthesis conditions (pressure, temperature, and reaction time), along with the application of a novel method for removing the carbon template, allowed the isolation of the mesoporous material. The synthesis of mesoporous silica polymorphs at high pressure now offers the opportunity to investigate thermochemical properties for the interaction between, for instance, stishovite and various guests, such as CO2, methane, or hydrogen to model fluid sequestration and mineral dissolution. [Stagno et al., Phys. Chem. Minerals, DOI:10.1007/s00269-015-0739-8 (2015)].